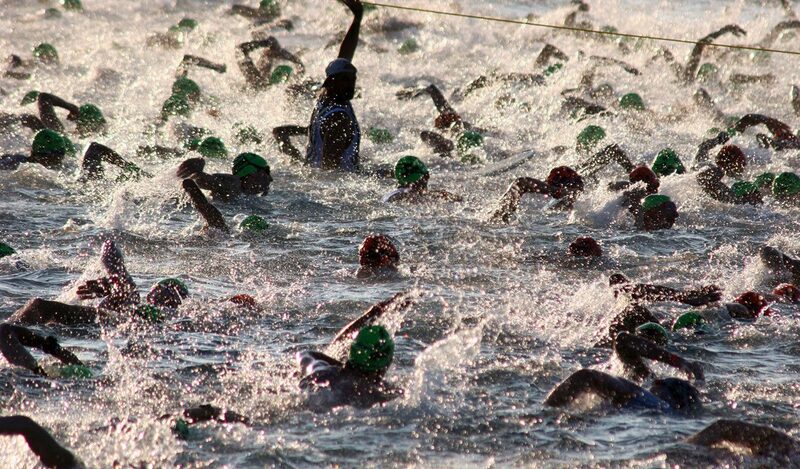 The Ironman Triathlon is the ultimate test of human endurance. The world’s best athletes must complete a 2.4-mile swim, a 112-mile bicycle ride and a marathon 26.22-mile run, raced in that order and without a break. It is widely considered one of the most difficult one-day sporting events in the world. What is the equivalent to this ultimate test of toughness in the world of wastewater treatment? Industrial plants, which push many wastewater treatment technologies to their limits. Why are industrial plants so challenging? In a food plant, influent can contain byproducts of food cleaning (sanitizing, peeling, cooking and cooling), mechanical activities (conveyor medium to transport food materials) and cleaning production equipment. Each of these waste streams has a unique composition and volume of waste water associated with it. Influent from the pulp and paper industry may be generated from washing and screening, bleaching or condensate processes to name a few and is generally high in suspended solids and organic material. 2. Water re-use/conservation. In recent years, industrial operations have come under significant pressure from environmental groups to conserve fresh and re-use or repurpose wastewater. Many industries have adopted these measures based on their own corporate initiatives to protect health and the environment. Conservation includes modifying or replacing traditional industrial processes to minimize water use. Water re-use is focused on pre-treatment – removing solids, solvents, organic compounds and other contaminants from the wastewater before it is merged with the flow from a municipal wastewater treatment system. In many cases, totally closed loop systems have been adopted where every ounce of water is recycled, reused or repurposed. 3. Sludge production. Where industrial wastewater can be treated biologically, there is a strong, ongoing need for treatment systems that offer the management of sludge removal and disposal. 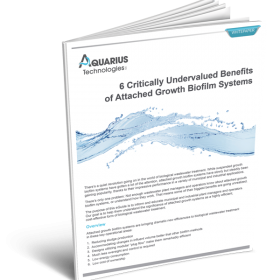 Why is an attached growth system well-suited to industrial waste treatment? 1. Large variations in the influent flows. Attached growth biofilm systems are able to accommodate hydraulic and organic load variations better than suspended growth systems. Rapid flow increases in suspended growth systems may wash microorganisms out of the aeration tank at precisely the time that a high concentration of them is needed. Consequently, the microorganisms are even washed out of the system with the clarifier effluent, resulting in significantly reduced performance. In contrast, because the microorganisms in an attached growth biofilm system are fixed to media, they cannot wash out with increased flows. Also, attached growth biofilm systems typically have a greater mass of microorganisms, making them better able to handle organic load increases. 2. Water re-use/conservation. Attached growth biofilm systems can help industrial plants reach their goals for removal of biodegradable organic substances from water used in their production processes. These treated streams may be re-used or repurposed in closed-loop water systems. The Aquarius Nebula™ MultiStage Biofilm system is especially well-suited to food, beverage and dairy applications or any biodegradable industrial wastewater. 3. Sludge production: The Aquarius Nebula™ MultiStage Biofilm attached growth process uses proprietary stationary textile media as the home for microorganisms. Oxygen for respiration and mixing of the microbes is provided through a fine bubble diffused aeration system. The result? This method of biological wastewater treatment can reduce sludge production by up to 80% when configured for sludge minimization. Sludge is minimized in the multi-stage plug flow treatment process by creating different treatment environments with specific microbial populations. A spatial succession of microorganisms (within cells) creates a food chain, beginning with higher food-to-microorganism ratios in the early stages and lower life forms and lower food-to-microorganism ratios in the later stages – where higher life form microorganisms consume the remains of smaller ones. This multi-stage approach to biological wastewater treatment results in significantly less sludge production. Many systems have been designed for sludge minimization – making an attached growth biofilm system an excellent match for many types of industrial operations. This entry was posted in Wastewater Treatment and tagged Industrial wastewater treatment.